"Bharara positions Doing Justice as a treatise on “the rule of law and faith in the rule of law” at a time when both are under threat. The contrast with Trump, and his contempt for the rule of law, is inevitable. Beyond simply rebutting the president, though, Bharara seeks to present the justice system Trump disdains as a source of inspiration for a healthier politics. His reflection on the role of the justice system in America is an effort both to make the inner workings of that system accessible to people unfamiliar with what criminal justice looks like from the perspective of law enforcement, and to suggest how people might apply ideals and habits honed in the courtroom to the patterns of everyday life." "His first book, Doing Justice: A Prosecutor’s Thoughts on Crime, Punishment and the Rule of Law, takes us back to basics, asking us to reflect on what truth means when a serial liar sits in the Oval Office; what civility involves amid all the social media yelling; and how to uphold the rule of law when thuggish behaviour appears to be the order of the day… At its most powerful, Doing Justice works as a metaphorical survival guide for the Trump era. As with everything Bharara does, he writes in a tone that is calm and considered, a warm bath after the outrage of Trump’s daily tweets… That’s what has made him such an unlikely superstar following his dismissal at Trump’s hands." "Like the best lawyers (and writers), Preet Bharara tells a good war story. But Doing Justice is a great deal more—a vivid memoir of a critical job, a primer on the toughest questions of prosecutorial ethics, and a reminder of the drama inherent in life in the courtroom arena." "Most chapters delight or provoke in some way... His book is ultimately about ordinary fallibility, and how those responsible for the dispensation of justice are regular humans, prone to act as humans do. It is filled with sobering stories about error and—in the more beautiful, memorable cases—ingenuity, determination, redemption... Bharara, as usual, makes a very strong case." "Doing Justice: A Prosecutor's Thoughts on Crime, Punishment, and the Rule of Law is written in a way that both an inside audience and a lay audience will savor. Trials and investigations are currently at the forefront of our national discourse, and Bharara does a superb job supplementing that conversation… What makes his book particularly absorbing—and worth reading—is that, among the many and important successes of his storied office, he also describes the uncertainty, the struggles, the failures and the dilemmas inherent in the work… Doing Justice is a consistently compelling and important tale, well written and well worth reading." "With DOING JUSTICE: A Prosecutor's Thoughts on Crime, Punishment, and the Rule of Law, Preet Bharara writes himself into the diamond circle of Clarence Darrow... now we have an un-put-down-able primer from the former U.S. attorney for the Southern District of New York (SDNY), written with immense skill and engaging style. He's tough, smart, and funny... He tells riveting stories from real-life experience... Preet Bharara writes that you will not find God or grace in legal concepts or in formal notions of criminal justice. But be assured that you'll find God and grace in this fascinating book." "In this fascinating combination of memoir and ethical-legal manifesto, former U.S. attorney Bharara posits that "the model of the American trial has something to teach us... about debate and disagreement and truth and justice." 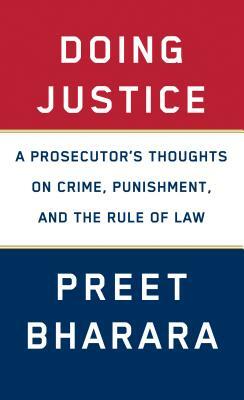 ...His prose has the quality of a well-written speech, with philosophical pronouncements, followed by supporting tales from both his legal career and his personal life, recounted in a superbly accessible and conversational, even humorous tone,.. Bharara also reminds readers that, while the law is an incredible tool, it is people who create or corrupt justice. With its approachable human moments, tragic and triumphant cases, heroic investigators, and depictions of hardworking everyday people, this book is a rare thing: a page-turning work of practical moral philosophy." "The former federal prosecutor for the Southern District of New York skillfully explains how he approached his job, offering a mixture of guiding principles and compelling anecdotes. Unlike many lawyers who write books, Bharara refreshingly avoids jargon, striking a conversational tone and regularly employing analogies and metaphors that make his points easily understandable. An engaging tour from beginning to end." "Bright with anecdotes from his lengthy and illustrious career, Bharara’s razor-edge judgments about punishment, procedure, outcome, and outlook address issues of governance and moral grounding that form the crux of the nature of justice. Bharara speaks with a clear, firm, and engaging voice in this essential primer about the importance of a fair and open justice system." “Doing Justice is an essential read for every American who cares about the rule of law and the pursuit of justice in the United States, particularly at a time when these ideals are a constant subject of attack for self-serving political purposes.